Our metal trellis panels have diamond latticework that will keep out all but the youngest rabbits and certainly any larger visitors such as deer & sheep (if you happen to live in their vicinity). It’s always good to know that your crops and tender garden plants are safe from unwanted visitors. 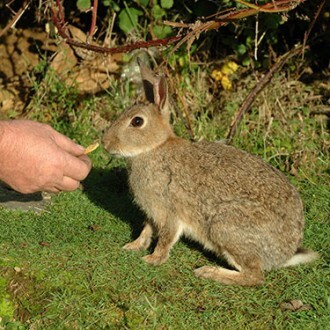 Our workshops have an abundance of wild rabbits living in the nearby woods and hedgerows. This fine specimen has been adopted by Birdie, our master wire-weaver, shown here feeding him with a biscuit! Fortunately, we don’t have any crops growing near our workshops, only the wild blackberries that get harvested later this month.